Leap and the net may not appear. Tasneem Jamal and her husband uprooted their lives and moved their young family to Tanzania to follow their dreams. But even before they left Canada, the plan started to go sideways, and soon, Tasneem was in freefall. Tasneem Jamal and her husband, Craig Daniels, had it made. They had jobs with benefits, they had a house and two young kids, but they also had these aching dreams that gnawed at them. Tasneem wanted to write a novel. Craig wanted to devote himself to flying planes. 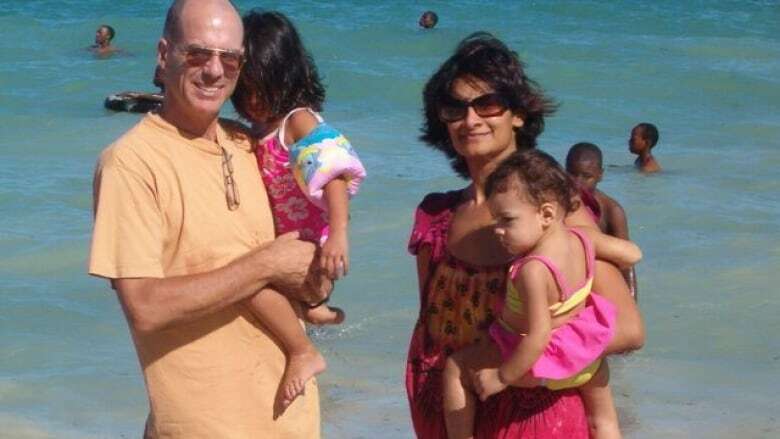 So they ditched their desk jobs, put the house up for sale and got ready to move to Tanzania, where Craig could fly for a living and where Tasneem could write and reconnect with Africa, where she'd been born. "I wanted to feel content in my life [...] and the unwritten novel came to represent this sense of something absent in me, and I think that was what was behind the power and the energy of the move. I really believed it would fix me." In 2008, the family flew to Dar es Salaam to start their new life. Pretty quickly, reality didn't match up with the fantasy. There were the bugs ("mouse-sized cockroaches," says Tasneem); the economy all over the world was tanking making it hard for Craig to find work. Everything was harder than they were used to. And then, there were the accidents. First, Tasneem and Craig's youngest daughter, 9-month-old Lily, fell head-first out of her crib onto a concrete floor. Lily recovered completely, but the accident was deeply jarring for Tasneem. "What have I done? What was I thinking? I hurt my child. I caused this." A month later, Craig was hit by a bus. He only suffered minor injuries, but it left Tasneem pretty bruised as well. She found herself thinking, "We don't have to be here. It doesn't have to be this hard." Tasneem says the relationship suffered as well — she and Craig were at each others' throats. "At some point it became clear the fantasy [...] it's not gonna happen." says Tasneem. "I had a really, extraordinarily entitled view of Africa, of the whole continent [...] and Africa was having none of it." Tasneem's experience in Africa was not what she had envisioned. She felt she'd failed as a mother, and failed as a wife. But as it turns out, there was deep value to be found amongst all the challenges. Amid the chaos, Tasneem had to let go; she had to accept that she had no control. She found herself writing more freely, from a deeper, more authentic place. "There is such a resourcefulness and such a creativity in the apparent chaos, that when I sat down to write I was messy; I wrote down ugly thoughts; I wrote down things I wouldn't have done before. I would have felt somehow constrained that I had to be a certain way and I didn't feel that in Dar. I felt I was okay, with all my flaws and all my mistakes." Tasneem doesn't necessarily recommend leaping into chaos, but for her, being able to let go of the plan and embrace the free fall led to a novel she's proud of — Where the Air Is Sweet — and an experience you can't put a price on.